by BNZ Materials Refractories : Made in USA !! 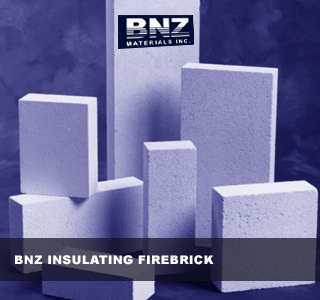 We offer high quality, American Made BNZ Refractories Insulating Firebricks. The prices shown for individual bricks are for smaller quantities (fewer than 500) shipping from our Sheffield MA warehouse and for in-store pick-up. Larger quantities which will ship on pallets direct ex-works carry significant discounts so please call or email for a quote. The 2300 degree bricks are available in the PA grade. The 2600 and the 2800 degree rated bricks are available in the excellent but economical PA grade or the high grade BNZ grade. IFB (Insulating fire bricks) also known as Soft Bricks are high temperature, lightweight refractories which are used as insulation in kilns, forges and furnaces. Many furnaces and kilns will require a combination of Soft Brick and Dense firebrick. We also stock castable dense and insulating refractories (Litewate and Loucast). Casatable refractories are great problem solvers whether constructing or repairing. We stock insulating Kaowool blanket and insulating high temp board as well as mortar and kiln cement. Gas and electric powered kilns and furnaces can use the Insulating Fire Brick in the firebox. Wood and oil burning kilns are constructed with hard-brick (dense firebrick.) They are then insulated with these IFB. Salt kilns and other applications which create corrosive atmosphere will also need to use dense firebrick (hard brick) in the firebox and use the IFB outside. Coal burning power plants often use specialized brick such as Silicon Carbide brick to resist the abrasive atmospheres there. Picking the correct bricks and other refractories for your application is crucial, so please email us or call to let us help you pick the correct refractories for your project or repair. From a back yard forge or oven to full scale coal burning power pants Sheffield Pottery has the materials you need ! Sheffield bricks and refractories are used in salt kilns, train kilns, tunnel kilns, Anagama kilns, gas kilns, furnaces, and ovens coast to coast. Call today to get started with your build or repair. Refractory bricks, blocks, and tiles are stacked to form insulating furnaces, boilers or other thermal process vessel walls. The soft bricks are usually cemented together with refractory mortar. Note: Soft bricks can be cut down with an ordinary carpenter's hand saw to create custom shapes where you need them. ** Wedges and Arches must be specified by number. NC28A2: G-28 SOFTBRICK ARCH #2 NC28W1: G-28 SOFTBRICK WEDGE #1 NC283: G-28 SOFTBRICK STRAIGHTS 3"